This project has been developed as a component of the Hyperhouse program. The MVR bathroom is a roll in, roll out stainless steel module with a built-in bath, shower, toilet and hand basin. It has been built around a 200 litre water storage and recycling unit. 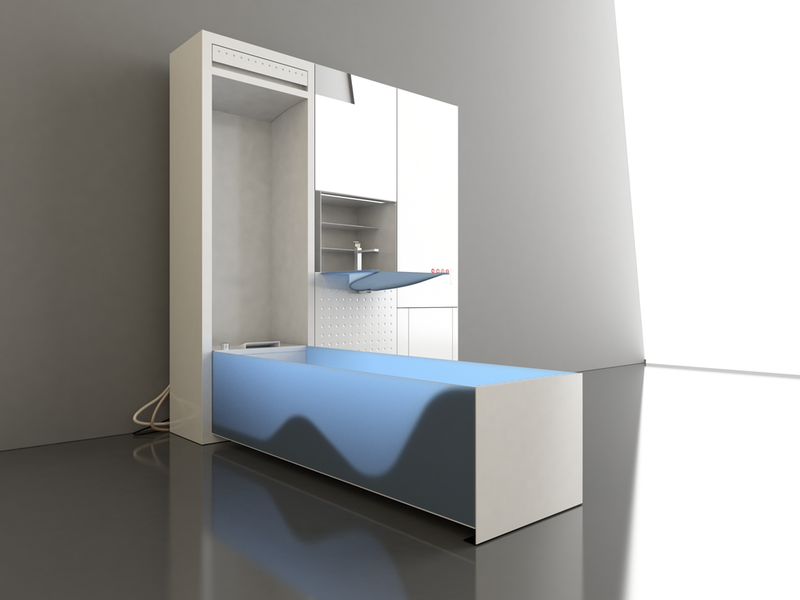 This bathroom can be rolled into any serviced space to make it habitable, either as a living, working or retail space. This mobile unit can be connected via flexible hoses and electrical cabling to traditional service outlets or to a flexible dry-break connection service system. All the sanitary fittings can be folded away to allow for flexible programming of the space. The bathroom systems are conceived to minimise water usage. The fitting profiles are designed to reduce water capacity for effective use by up to 50% over traditional fittings. The design cross-sections of the bath and basin have been carefully reduced through ergonomic study to do away with water holding space that is non-functional, without sacrificing comfort or functionality. The toilet employs ‘dry toilet’ technology, using only 10% of the water required by a traditional toilet. The unit features a non-mechanical system to liquefy solid waste for efficient disposal. Sewage plumbing cross-sections are thus also be reduced, to 30mm. The toilet pan and shower-head retract into the bathroom module and the bath folds up into the shower recess. Grey water from the shower and hand basin is distilled and purified by the mechanical vapour recompression unit. By boiling water in a vacuum, like boiling a cup of tea on the top of Mount Everest, boiling occurs at a lower temperature due to lower atmospheric pressure, requiring much less energy. The water is then sterilised by an in-line ultra violet light source. This water, now potable, is stored in the 200 litre holding tank for reuse in the shower and hand basin and for flushing the toilet. Design: Michael Trudgeon, Anthony Kitchener, John Burne. This project was originally undertaken as part of the RMIT Centre for Design Appliances of the Future program.